Proverbs 3:5 Trust in the Lord with all thine heart and lean not to thine own understanding. In all thy ways acknowledge him and he shall direct thy paths. Psalms 37:3 Trust in the Lord, and do good: so shall thou dwell in the land, and verily thou shall be fed. Psalms 37:5 Commit thy way unto the Lord: trust also in him; and he shall bring it to pass. Q: God Why is Trust so Important? With True Trust ~ Comes Divine Direction! TRUST is Total Confidence in the Integrity, Ability & Good Character of Another. One in Whom Confidence is Placed. Something Committed into the Care of Another. 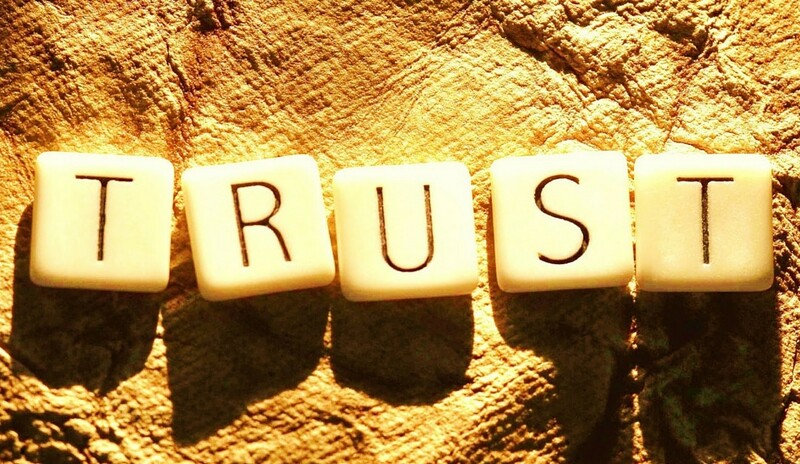 Mistrust or Lack of Trust has to do with LOSSES and UnHealed Hurts. Loss of Possessions, Loss of Relationships: Family & Loved Ones; Loss of Church Fellowship, Loss of Friendship, Rejection by those you expected to love you and they did not come through. Those who cannot TRUST OTHERS have TRUST ISSUES. Trust Issues ~ gives way to Suspicion, Fear, Anger, Murmuring, Complaining, Jealousy, Rejection, Irrational Thinking, when these Issues go unchecked they may Graduate into Bitterness & Un-forgiveness causing a breach in one’s ability to commune with the Lord. Women who were hurt by their fathers or significant men whom they trusted in their lives, find it challenging to Trust again. Men who lose trust in other men or women tend to trust in no one, but themselves. Once Trust is Broken without the Inner Healing & Delivering Power of the Lord Jesus, that Wound is like an open sore ~ Left to fester. Our soulish wounds are never healed until we deal with these Trust Issues. Our Natural Trust is in the temporal (Carnal) realm ~ As long as I can see you ~ I can trust you. Or as long as I understand what you are doing ~ I will trust you. The Lack of Trust in God (Divine Mistrust) will blind you and keep you from seeing that your prayers are answered. Fear abounds instead of Faith. Fear abounds instead of grace, God wants us to see that his grace abounds. That is why it is important to Trust in God and in the things that you cannot see. For your Natural Senses/Feelings will fool you. They sometimes have you to believe the false instead of the truth. Your level of trust is only colored by how much you have learned to trust God. Where there are trust issues with God, you certainly will not allow yourself to trust those you see. Heaven help trusting those you do not know. Even when man breaks his promises, God will not break His. We must learn to Yield Ourselves unto God and let Him direct our lives. Trust can be broken and regained. It is important to learn to trust God and Keep our eyes off of Man. Your personal losses when Temptations, Trials & Tests arise these will color your ability to see a man’s heart as God sees it. Question: LORD HOW CAN ONE REBUILD TRUST, ONCE IT HAS BEEN BROKEN? We start rebuilding the Building Blocks of TRUST by acknowledging that man is filled with fault. Man is filled with character flaws. We may never do enough to keep from offending someone else. Offenses will come, says the word. Understanding that as humans we will never be perfect in the eyesight of others. God is the ultimate judge and standard of human perfection. His holy word gives the standard for us to live by daily. Be ye perfect even as I am perfect, says the Lord. This word perfect refers to divine maturity, not human perfection. In life, we often place certain individuals on a pedestal, e.g. husbands, wives, children, pastors, Priests, Presidents, Leaders of all sorts. Yet until we are offended by their actions then TRUST is broken. Continual offenses causes trust to be completely destroyed. At times these offenses are nothing more than a Set-Up by the enemy to cause distractions or to cause you to miss God’s plan for your life. The devil wants you & I to be derailed like on a moving train and miss our station. When offenses come and they are not dealt with; they can easily graduate into rejection, un-forgiveness, bitterness and even hatred which completely destroys a believer’s ability to get their prayers answered by God. Secondly, understanding that the eyes we use to judge others are tainted by our own 1) prejudges, 2) culture by which we were raised, our 3) values, what we believe is right or wrong. In other words, A man’s ways are clean in his own eyes. To ourselves we can do no wrong. But the Lord weighs our spirit. The LORD measures our attitude towards Him ourselves and others. A Sure way to rebuild TRUST is to enter into Prayer concerning, asking for Forgiveness and repenting for wrongs done to others and offenses against you. As we remain steadfast in prayer God will grants a breakthrough. TRUST is a choice that can be made when we believe that God will bring peace into our hearts and lives instead of the FEAR that fuels MISTRUST.